Denis Johnson’s The Laughing Monsters, reviewed. 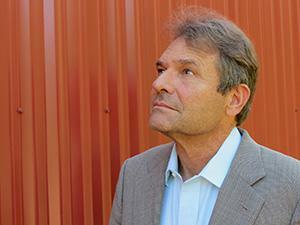 Denis Johnson returns to Africa, this time in fiction. Throughout the 1980s and early ’90s, Denis Johnson sent a half-dozen tortured protagonists careening through lower class Arizona, post-apocalyptic southern Florida, Sandinista-controlled Nicaragua, soggy Provincetown, and the heroin-rattled Pacific Northwest. These men (and one woman) were all emotionally and financially desperate, often compelled to substance abuse, and tended to drift from one awful decision to another. But Johnson always found the hypnotic energy in these low-life stories. His prose adjusted subtly for each novel, molding to each character’s mindset while maintaining an imagistic, druggy stillness. Even in their titles—Angels, Fiskadoro, The Stars at Noon, Resuscitation of a Hanged Man, Jesus’ Son—Johnson’s early books convey a roving, exotic energy, one that belies their hardscrabble characters and dirty struggles. And then he went to Africa. Johnson first visited Monrovia, Liberia, in 1990, then went back two years later to profile the aspiring warlord (and later Liberian president) Charles Taylor for The New Yorker. Here, it would seem, was a setting commensurate with Johnson’s violent, hallucinatory gifts—a place where criminal plans could go awry as in Angels, political unrest could unravel a journalist as in The Stars at Noon, or catastrophe could level civilization altogether, as in Fiskadoro. It was also seemingly a place where Johnson could indulge his extraordinary talent for physical descriptions (years later I still remember an Arizona sunset from Angels: “fields of alfalfa breathed green heat into space”) and his unrelenting focus on disquieted souls in limbo between terrifying situations and natural beauty. Only now, a quarter-century after his first trip to the region, and after subsequent protagonists have pressed through contemporary rural California and the Midwest, the early-20th-century frontier, and Vietnam, has Johnson found a fictional frame to speak about West Africa. His new novel, The Laughing Monsters, takes place in Sierra Leone and the Congo and certainly reflects that earlier contention about waiting. This is a novel where action is either nonexistent or purposely confusing, and nobody ever figures out where they’re going or why they’re going there. The narrator, a Danish-American spy named Roland Nair, finds himself entangled and immobilized at every turn—by the deadening heat, by his uncertain mission, and most especially by his old confrere, an African businessman-soldier named Michael Adriko, who drags Nair deep into the wilderness and never quite reveals his allegiances or goals. I was glad she didn’t know English. I could say whatever I wanted to her, and I did. Terrible things. All the things you can’t say. Afterward I took her downstairs and got her a taxi, as if she had somewhere to go. I shut the car’s door for her and heard the older drive saying even before he put it in gear: “You are a bad woman, you are a whore and a disgrace …” but she couldn’t understand any of it. Johnson doesn’t present this behavior at all sympathetically, but it’s not the only time that an African woman is reduced to rubble in this novel; others are run over, raped, and promptly discarded. The only prominent female character in the book is Adriko’s fiancée, Davidia, who Nair describes strictly in terms of her unbelievable sexiness. The Laughing Monsters’ moral universe is so ugly that misogyny only counts as a minor crime, but it’s never clear just whose ugliness Johnson is ultimately indicting. The entertainment got too loud. I adjusted my screen and put my fingers on the keyboard. Rude of me. But I hadn’t asked him to sit down. “My wife is quite ill,” he said, and he paused one second, and added, “terminal,” with a sort of pride. Meanwhile, two meters off, by the pool, the performer had set his shirt and pants on fire. The commander claims to be regular Army but could easily be lying, or just confused. His cammy uniform bears no insignia. Beneath his open tunic he wears a T-shirt with the faded emblem of a bottle on it, soda or beer. Denis Johnson has written some of the greatest nothing-doing passages I’ve ever read, and some of the most horrifying. His two signature books are picaresque trips through the Pacific Northwest in which the protagonists never seem in control of their lives. In Jesus’ Son, set in the 1980s, that lack of control is a symptom of the narrator’s heroin addiction; divided into taut, emotionally severe short stories, the book sputters and falls as characters die then reappear, or events get rearranged. In Train Dreams, the hero is Robert Grainier, an early-20th-century laborer, and though the narrative is more linear than in Jesus’ Son, Grainier’s path feels similarly determined—by the natural world, and by the technological progress that cuts through it in the form of trains, planes, and settlements. In both books, Johnson skillfully depicts a specific community and period of time, but he does so impressionistically. A wonderful poet as well as a novelist, Johnson’s prose moves from image to image, punctuated by his characters’ quiet sensations of grace or mystification. Wherever his characters are in the world, Johnson’s interest is in their interior states. But there is something in West Africa that apparently overwhelms him, and neutralizes his gift for poetic emotional chaos. This new novel never quite settles on a coherent tone, which is odd since his language is typically calibrated to exact a specific mood or mental state. His books rarely have page-turning plots, but they all have momentum. The Laughing Monsters plods, however, and Nair’s isn’t a full-enough consciousness to make up for it. You should still read this book; Johnson remains capable of tiny life-giving descriptions. 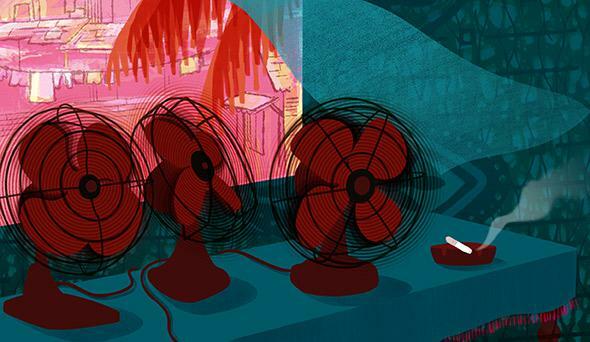 (“Nothing now but the sound of my breath and the prayers of three small cooling fans.”) He’s my favorite living writer. But after The Laughing Monsters, I had to reread a few pages of Angels to remember why. The Laughing Monsters by Denis Johnson. Farrar, Straus and Giroux.